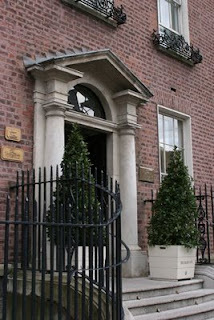 The business card read “My residence in Dublin,” and gave The Merrion’s address and contact information. A stack of them sat on the desk in my jewel-box of a room, and they summed up my precise feelings about The Merrion. Indeed, it felt as if I’d found a new home. And it is that home-away-from-home feel that The Merrion strives for with each thoughtful detail. The hotel occupies what used to be four separate 18th century town homes in the heart of Dublin’s Georgian quarter. In the mid-1990’s the homes had fallen into disrepair and were purchased and carefully restored and combined to become the heart of The Merrion. In fact, when my taxi pulled up in front of a charming but unassuming front door, I wasn’t sure the driver had delivered me to the right place. But where most hotels broadcast their presence on the street, arriving at The Merrion feels much like arriving at the home of a friend -- who happens to have a fabulous house. Walking through the front doors on a slightly chilly day, I was greeted by the cozy smell of peat burning in the fireplaces throughout the first floor. The Merrion features one of the finest collections of 19th and 20th century Irish art hung throughout the hotel. From the comfortable couches in the Drawing Rooms, I sipped an Irish coffee and admired the work of Irish masters including Jack B. Yeats (brother of W.B. Yeats), Sir John Lavery, William Leech, and Daniel Maclise among others. The art both emphasizes the “Irishness” of the place and anchors it in Dublin’s history. Between the art collection, the linens and textiles, the bath products, the gorgeous plaster moldings, and the locally-sourced foods… The Merrion is a celebration of Dublin. But make no mistake, this is a hotel, not a museum, and it has all of the amenities a guest might need. The Georgian wing of the hotel opens up on to a gorgeous garden with a patio. A newer building beyond boasts more guest rooms as well as a spa and pool. And The Merrion hosts three restaurants as well as a snug bar. The final result is a hotel which feels both historic and cozy and rather unlike a hotel all at once. The Shower: great water pressure and even better bath products. Leave your shampoo and soap at home! The Merrion offers a fantastic array of bath products that smell like Irish heather and moss and are made in Ireland. The Bed: lovely. a firm mattress and the covers were perfect – not too many and certainly adequate. Plus, each evening a pair of slippers was laid out next to my bed and a fresh bathrobe hung in the bathroom. The Green Report: The Merrion is part of the Greening Irish Hospitality initiative and has earned a Bronze award. They currently sort and recycle all waste in the hotel (despite the fact that all waste bins are commingled in the guest rooms). In their laundry facilities, the Merrion uses green detergents, and they are working to reduce paper usage as well. Internet Access: free broadband in the rooms. WiFi is available throughout the hotel, but it is expensive. All guests also have free access to the Business Center where there are two computers available for use as well as printers. Children Welcome: Children are greeted with child-sized robes and slippers as well as snacks for the young traveler. There is also a complete children’s menu, which features healthy foods for a simpler palate and can be enjoyed at all of the hotel’s restaurants. The Merrion is not, however, a family resort. 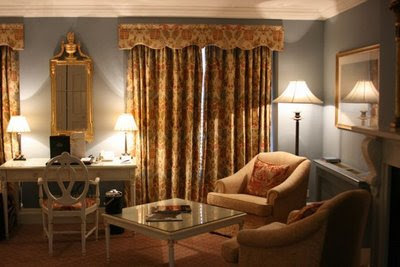 It is a sophisticated downtown hotel and one of the best hotels in Dublin. The concierge can help to arrange child-friendly activities, but there aren’t any activities organized at the hotel. Breakfast: included in the room price, and it is lavish! The buffet includes yogurt and fresh fruit, gorgeous breads, cereal, cheeses, a fabulous homemade granola, and the best chocolate-chip muffins I’ve ever had in my life. And if that doesn’t suit you, you can also order off of the a la carte menu. Notes: the rooms in the Georgian part of the hotel are more expensive, but they are worth the splurge. Each room has been meticulously restored and has an individual character. The rooms in the newer part of the hotel are beautiful and posh, but they have less charm. However, the rooms in the Georgian town homes fill quickly, so make your reservations early and be specific about your wishes. I stayed in a charming room in house No. 21. While the Georgian houses have been combined, small brass plaques mark the transitions from one house to the next, and each room maintains some of the houses’ original character. My room was painted the perfect shade of Georgian blue with white furniture and gold accents. The room was spacious with a sitting area, a writing desk, and a fireplace. The closet was very useful with drawers as well as hanging space. And while the bathroom was not overly grand, it was perfectly functional and beautifully furnished. In many ways, though, my room was the epitome of the Merrion experience. The room was comfortable, functional, and elegant. But there over the mantle was the coup de grace -- a gorgeous mirror. The antique frame was gilded and featured scenes from Greek mythology – the perfect Georgian detail which finished the room. The Merrion’s service is as gracious as its décor. From the afternoon tea service to the incredibly helpful front desk staff, from the attentive waiters in the Cellar Restaurant to the silent housekeepers, each experience was discreet, attentive, and thoughtful. Perhaps the story of my laundry best illustrates The Merrion’s extraordinary care. 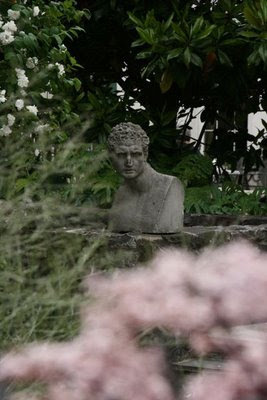 By the time I had arrived at The Merrion, I’d been traveling for a week, and I had more than a week left on the road. I don’t tend to travel with a lot of clothes, and I needed to do laundry. I’d done a quick calculation, and to have The Merrion’s laundry service do my small bag of dirty clothes was going to cost well over €150 – a price far too steep for my budget. So, I called the laundry to ask if there was a laundromat nearby where I could do wash myself. I do this frequently, and generally I spend a sudsy afternoon and return home with clean duds for under €20 mid-trip. Money well spent. However, the woman I spoke to at the laundry didn’t know of a self-service place nearby. “Let me make some calls,” she said. A few minutes later the same charming young woman picked up the bag of dirty clothes from my room, delivered them to a local laundry, and picked them up again the next day – all for the cost of €18. The hotel did not even assess a service fee – the epitome of good service and the kind of attention which makes The Merrion feel like home. From the elegant furnishings to the exemplary staff, each detail at The Merrion is designed to make a traveler’s experience one of grace, comfort, and ease. Packing to leave The Merrion and to continue on my travels, I tucked one of the business cards into my bag. I’d be very happy to count The Merrion as my residence in Dublin again one day. A cab ride from the airport to The Merrion will set you back about €20. The hotel is also near major bus lines and offers parking for those who are renting a car, though I don’t recommend trying to drive in Dublin if you aren’t accustomed to driving on the left-hand side of the road. 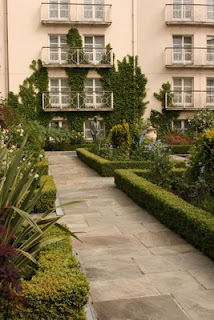 The Merrion is located in the heart of Dublin. Just up the street take a stroll through Merrion Square. The National Gallery, Ireland’s largest art museum, is steps away. Beyond that you will find the National Museum, home of the “bog people.” And Nassau Street, Trinity College (home to the Book of Kells), and Temple Bar are all within easy walking distance. Note: my stay at The Merrion was sponsored by The Merrion and KiwiCollection.com. 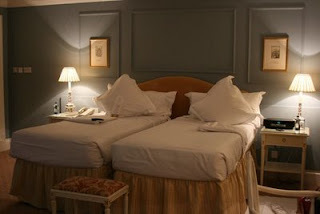 They provided me with two nights accommodation at The Merrion. Read more about my review policies. Your description is so inviting, I think I will try to stay at the Merrion next week while in Dublin! Thanks for such a beautifully written and informative review! I will try to stay at this place in my next trip while in Dublin because a good location and best accommodation makes your trip more enjoyable.